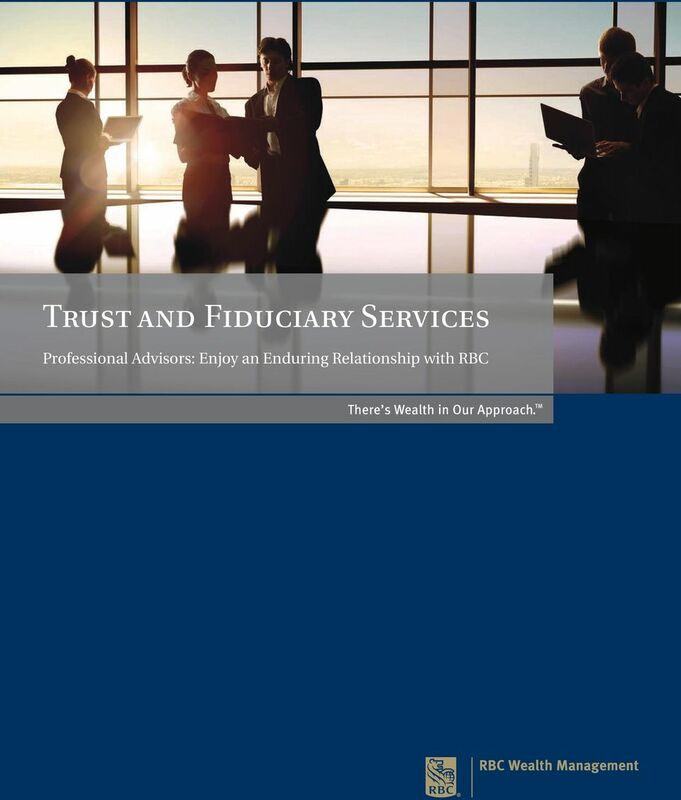 Download "Trust and Fiduciary Services. 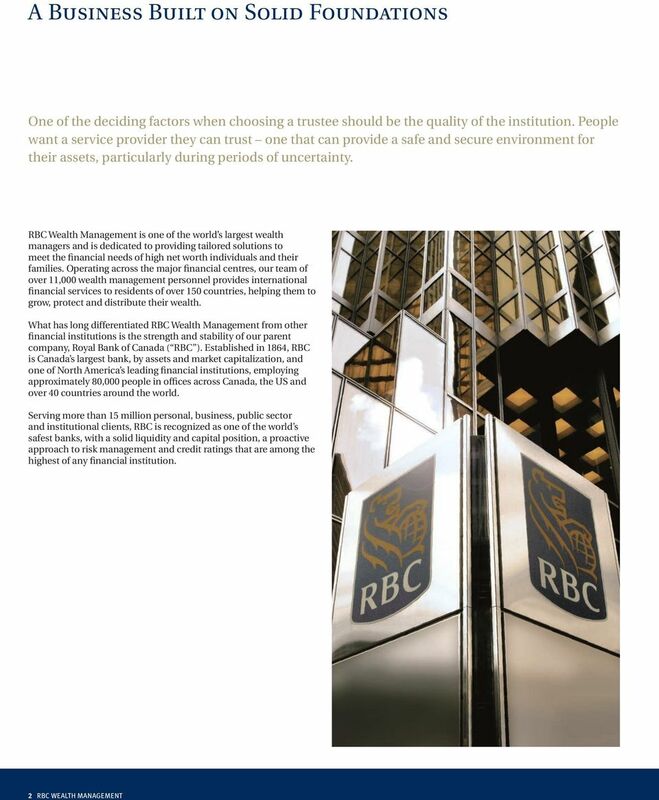 Professional Advisors: Enjoy an Enduring Relationship with RBC"
11 This publication has been issued by Royal Bank of Canada on behalf of certain RBC companies that form part of the international network of RBC Wealth Management. 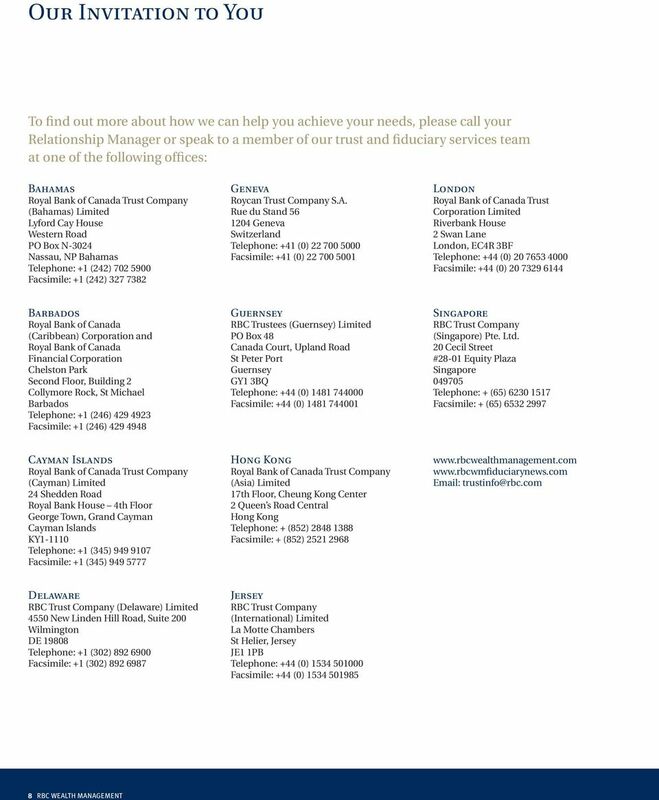 RBC Wealth Management offers trust and fiduciary services via the principal operating companies detailed below. Services outlined may be provided by a variety of Royal Bank of Canada subsidiaries and offices, either independently or acting together, operating in a number of different jurisdictions. 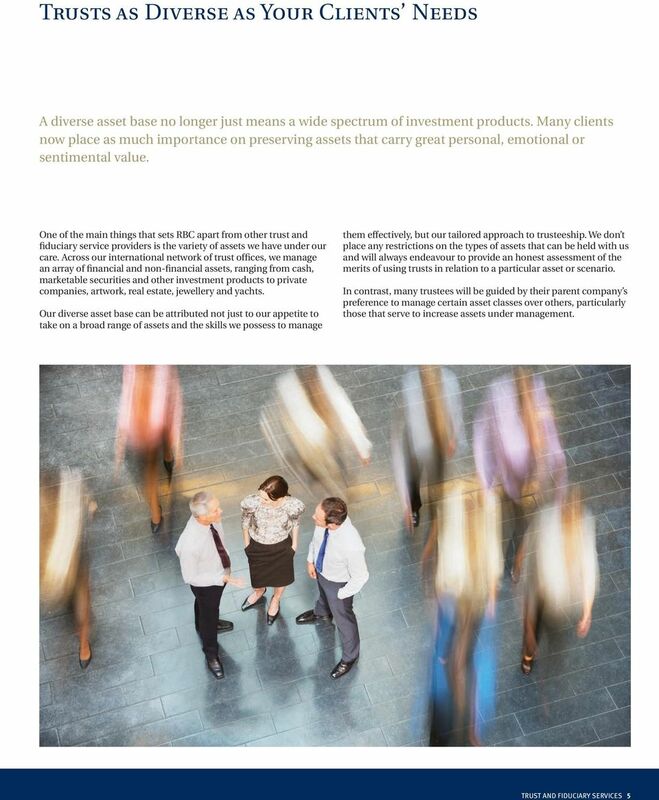 You should note that the applicable regulatory regime, including any investor protection or depositor compensation arrangements, may well be different from that of your home jurisdiction. Some of the services detailed in this document are not offered in all jurisdictions and may not be available to you. 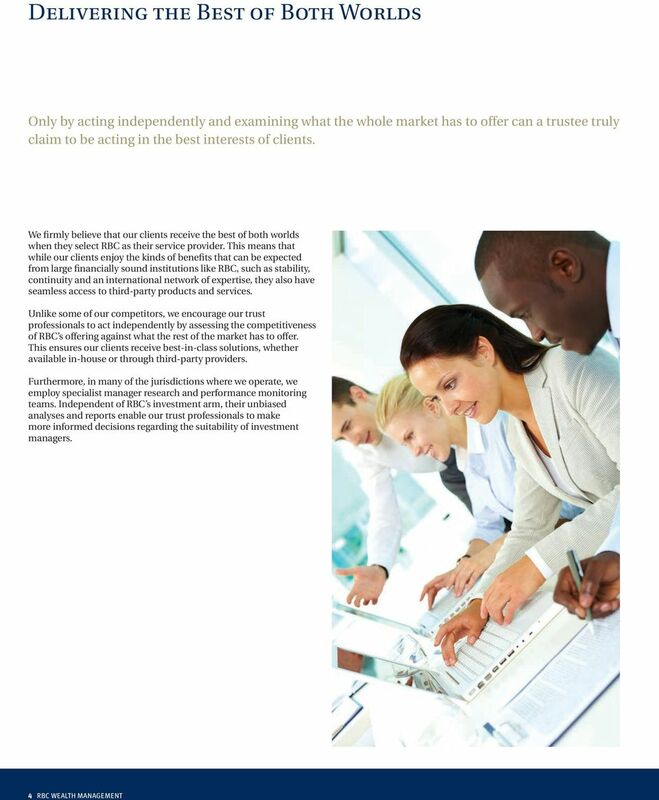 You should carefully read any risk warnings or regulatory disclosures in this document or any other literature enclosed with this document or forwarded to you by Royal Bank of Canada s subsidiaries or affiliates. This document is intended as general information only and is not intended as tax, legal, investment or other professional advice. You should always obtain independent professional advice particular to your individual circumstances. The information in this document is based on sources considered reliable at the time, but no representation is made regarding its completeness or accuracy and no obligation is undertaken whatsoever to update it for any changes of law or interpretation. 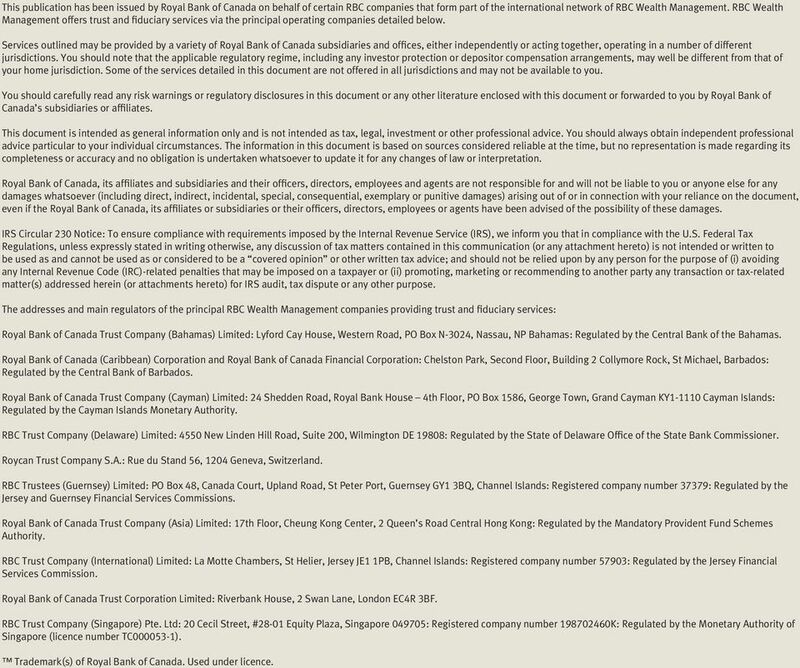 Royal Bank of Canada, its affiliates and subsidiaries and their officers, directors, employees and agents are not responsible for and will not be liable to you or anyone else for any damages whatsoever (including direct, indirect, incidental, special, consequential, exemplary or punitive damages) arising out of or in connection with your reliance on the document, even if the Royal Bank of Canada, its affiliates or subsidiaries or their officers, directors, employees or agents have been advised of the possibility of these damages. IRS Circular 230 Notice: To ensure compliance with requirements imposed by the Internal Revenue Service (IRS), we inform you that in compliance with the U.S. Federal Tax Regulations, unless expressly stated in writing otherwise, any discussion of tax matters contained in this communication (or any attachment hereto) is not intended or written to be used as and cannot be used as or considered to be a covered opinion or other written tax advice; and should not be relied upon by any person for the purpose of (i) avoiding any Internal Revenue Code (IRC)-related penalties that may be imposed on a taxpayer or (ii) promoting, marketing or recommending to another party any transaction or tax-related matter(s) addressed herein (or attachments hereto) for IRS audit, tax dispute or any other purpose. 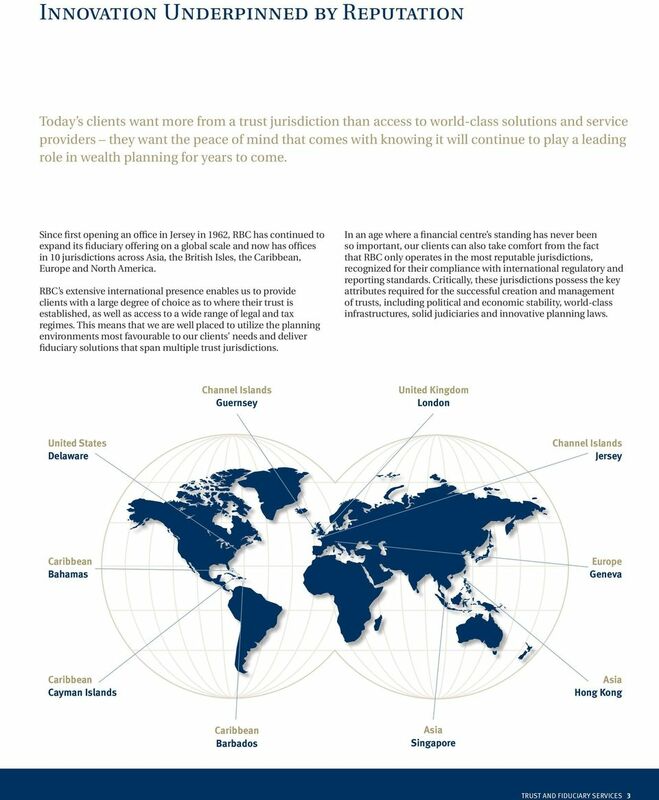 The addresses and main regulators of the principal RBC Wealth Management companies providing trust and fiduciary services: Royal Bank of Canada Trust Company (Bahamas) Limited: Lyford Cay House, Western Road, PO Box N-3024, Nassau, NP Bahamas: Regulated by the Central Bank of the Bahamas. Royal Bank of Canada (Caribbean) Corporation and Royal Bank of Canada Financial Corporation: Chelston Park, Second Floor, Building 2 Collymore Rock, St Michael, Barbados: Regulated by the Central Bank of Barbados. Royal Bank of Canada Trust Company (Cayman) Limited: 24 Shedden Road, Royal Bank House 4th Floor, PO Box 1586, George Town, Grand Cayman KY Cayman Islands: Regulated by the Cayman Islands Monetary Authority. RBC Trust Company (Delaware) Limited: 4550 New Linden Hill Road, Suite 200, Wilmington DE 19808: Regulated by the State of Delaware Office of the State Bank Commissioner. Roycan Trust Company S.A.: Rue du Stand 56, 1204 Geneva, Switzerland. RBC Trustees (Guernsey) Limited: PO Box 48, Canada Court, Upland Road, St Peter Port, Guernsey GY1 3BQ, Channel Islands: Registered company number 37379: Regulated by the Jersey and Guernsey Financial Services Commissions. Royal Bank of Canada Trust Company (Asia) Limited: 17th Floor, Cheung Kong Center, 2 Queen s Road Central Hong Kong: Regulated by the Mandatory Provident Fund Schemes Authority. RBC Trust Company (International) Limited: La Motte Chambers, St Helier, Jersey JE1 1PB, Channel Islands: Registered company number 57903: Regulated by the Jersey Financial Services Commission. Royal Bank of Canada Trust Corporation Limited: Riverbank House, 2 Swan Lane, London EC4R 3BF. RBC Trust Company (Singapore) Pte. Ltd: 20 Cecil Street, #28-01 Equity Plaza, Singapore : Registered company number K: Regulated by the Monetary Authority of Singapore (licence number TC ). Trademark(s) of Royal Bank of Canada. Used under licence. Asset Management. 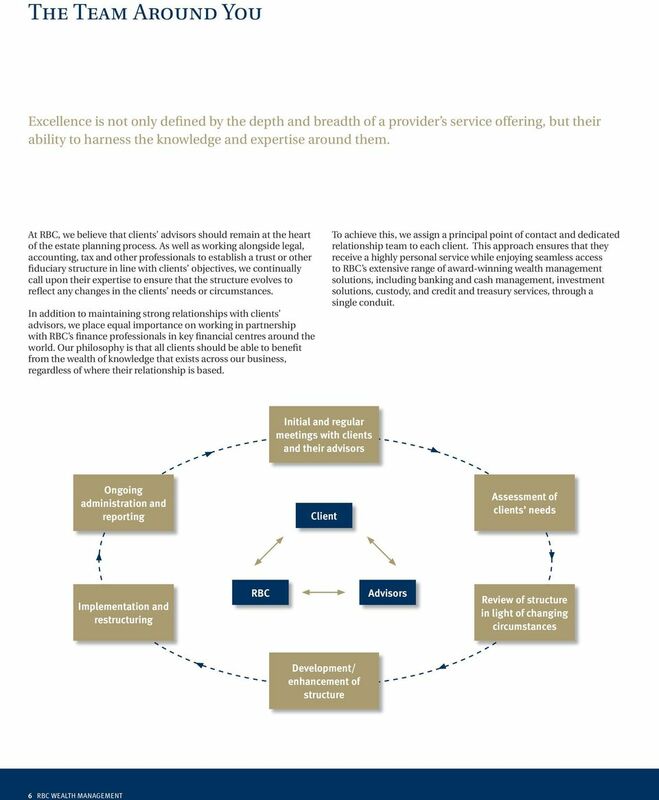 For insight and guidance tailored to the changing asset management climate of the Channel Islands. kpmg. 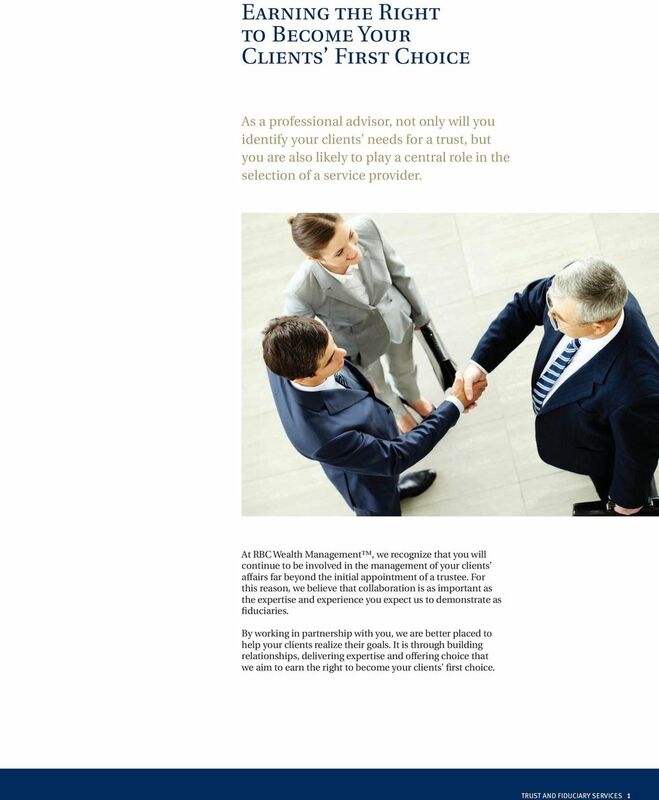 COMPANY PROFILE GLOBAL NETWORK BESPOKE SOLUTIONS LONG TERM RELATIONSHIPS BIZSERVE CONSULTANTS LTD is a corporate and trustee service group with affiliated offices in Greece, Bulgaria, Romania and Moldova. Management Alta s team of professionals set us apart. Our associates are CPAs, attorneys, business, and insurance professionals with the most extensive, sophisticated experience in the Captive industry. TAX SERVICES. Maximizing benefi ts. Minimizing risk.